Make delicious soups, healthy smoothies, tasty pasta sauces and more with the Breville Blend Active Pro Food Prep Blender. 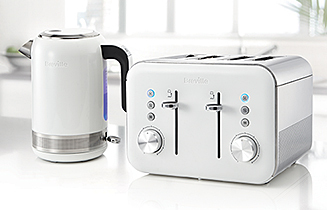 This sleek and compact kitchen appliance is easily stored in cupboards or on work surfaces, so it’s always ready to go. 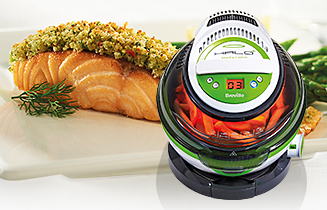 It can blend, chop, grind or puree in seconds – healthy foods never tasted so good! 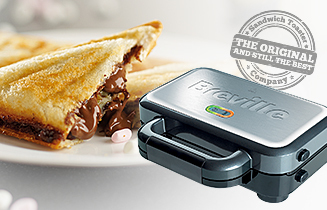 You just can’t beat the taste of homemade food and thanks to the Breville Blend Active Pro, you won’t even try! Use the food processor to quickly and easily prepare tasty and nutritious meals at the touch of a button. 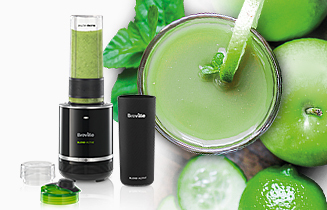 It works in four ways, so food can be blended for nutritious smoothies and shakes; chopped – no more crying over chopped onions; pureed for the most delicious pastes and pesto; or ground – it’s great for nuts, seeds and even coffee! The one-button control makes this a breeze to use – you press pulse for delicate chopping or keep the button pressed for some serious grinding action – while the smart design means switching between attachments can be done quickly and easily. The unique functionality means you can fill the bottle with your choice of ingredients, screw onto the base and blitz for the perfect smoothie, and then be on your way in no time (conveniently saving on washing up in the process!). It also comes with two 600ml water bottles with sports lids, so you and a friend can take your morning smoothies (or lunchtime soups) with you on the go. The sleek and compact 300W machine can be stored neatly and easily in cupboards or on work surfaces so that it’s always ready for action. What’s more, it’s fully dishwasher safe so washing up needn’t be a chore anymore. Breville Blend Active Pro Food Prep Blender is rated 4.6 out of 5 by 21. Rated 5 out of 5 by Bonzo from Recommended in Which. Excellent. Does all that I need. Rated 3 out of 5 by Kate from Neat little smoothie maker but not a lot of power. I liked this product as it came with two good sized bottles to make two smoothies at the same time. But it's pretty weak and the bigger cup didn't blend very well. It's okay for the price and looks nice and neat. I would recommend for the occasional smoothie but not for everyday use. I'll use it until it wears out then go back to a 600w plus machine!